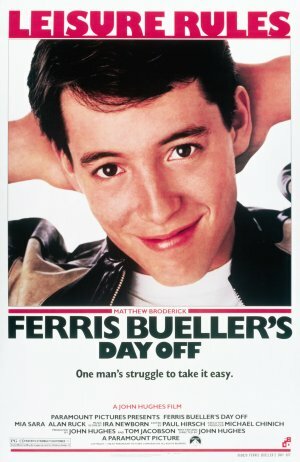 What It’s About: A high school student, Ferris Bueller (Matthew Broderick), decides to take a much needed day off, creatively faking illness to his parents so they support his decision to stay home. Of course, it’s far too nice a day not to take advantage of the great city of Chicago. So, Ferris enlists his best friend, Cameron (Alan Ruck), who is legitimately sick, and perhaps more importantly, Cameron’s car. The next step is to pull Ferris’ girlfriend (Mia Sara) out of school and then it’s off to a day of adventure, including lunch at a fancy restaurant, an afternoon baseball game, and participation in a parade, as the stakes grow higher and higher that they might get caught. Their most ardent pursuer is Principal Edward Rooney (Jeffrey Jones), who suspects Ferris is faking his illness, but Ferris must also contend with his sister (Jennifer Grey) who’s envious of his popularity. In the end, everyone involved learns a little something about life and themselves. Why Watch It Today? : It’s getting late in the school year, and one might be craving a day off. Wikipedia lists today as a popular choice for a senior skip day, and while it’s a Sunday, there’s no harm in planning ahead. Alternatively, the movie has some good suggestions for anyone already enjoying any kind of holiday time off or vacation. This entry was posted in Action, Buddy Flick, Chase, Comedy, Coming of Age, Juvenile Delinquent, Movie of the Day, Road Trip and tagged abe froman, Ben Stein, Chicago, day off, high school, John Hughes, Matthew Broderick, Mia Sara, Paramount Pictures, sausage king, sick day, teens. I love this film! It’s humour and sense of adventure mean it’s barely dated since it was released.